Webinars can be a highly effective way of bringing more traffic to your site, converting visitors into buyers, and engaging more effectively with your existing audience. A webinar is essentially a live video broadcast where viewers have the opportunity to discuss the content and ask questions in real time. Most webinars are instructional in nature, as this type of video is more appealing to viewers, but webinars can also be pure discussion-based, interviews, or demonstrations. There’s usually a question and answer session at the end and viewers can ask questions by using a chat box integrated into the webinar software. Webinars often have a limited audience number and may require interested parties to sign up for access in advance. However it’s also common to record webinars and upload them so that those unable to attend live can watch at a later date. Webinars can be free or may require users to pay a fee to attend. 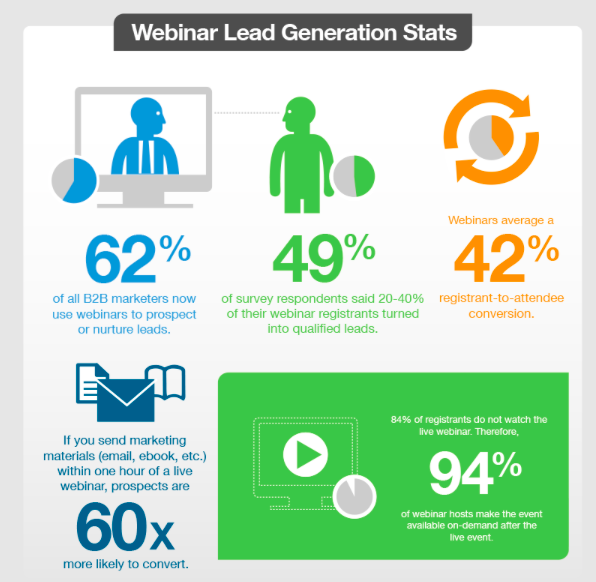 Webinars can be a highly effective way of marketing your business. 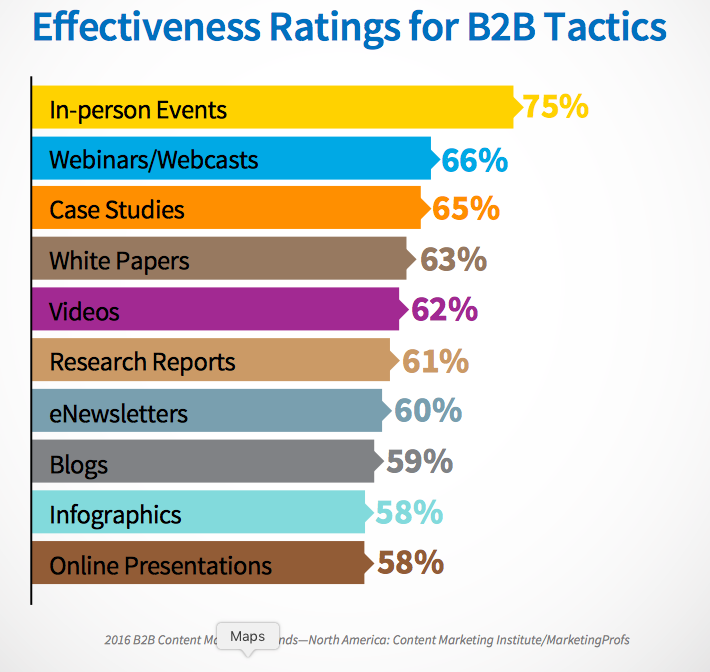 According to the Content Marketing Institute, 66% of organizations use webinars for B2B marketing and they are rated one of the most successful forms of content, with only in-person events rated higher. Hosting a webinar is one of the easiest ways any business can generate leads, as users must sign up with their name and email to attend. Even better, these are “warm” leads – more likely to turn into an eventual sale, as nobody signs up for a webinar unless they’re interested in the subject being discussed. During the webinar you have a captive audience that you can communicate with and sell to directly, unlike more passive types of content like blog posts. You can also tailor the content in real-time, based on comments and questions from the attendees. It’s also easier to reach a wider audience with a webinar as you can promote them as valuable one-off content that will attract individuals who aren’t already following your blog or social media. Webinars are also a popular type of content for affiliates to promote, as the lead conversion rate is so high – some studies show around 20 – 40%, compared to an average landing page conversion rate of 2.35%. Even if you’re not selling anything, Webinars are a fantastic way to provide more value to your existing audience and find out more about their needs in order to provide more value. Ability to switch between slides and live video and/or between different computers so that a webinar can have more than one host. In addition to this you’ll also need a signup form for the webinar (and a method of taking payment if it’s a paid webinar). If you plan to make a sales pitch during the webinar you’ll also need to prepare a sales page for viewers to purchase your product – these are usually most effective if they are limited in terms of number available or time until the sale closes, so you’ll want software that can display some kind of ticker or countdown timer to monitor this and increase the sense of urgency for potential buyers. If you’re selling some kind of digital product in the webinar, you’ll also want to create a sales landing page targeted at webinar viewers. Unless you’re using pro webinar software, the easiest way to create a signup page is by embedding the form code generated by email marketing software like MailChimp or Aweber. This way you can add users to a mailing list and send them reminders about the webinar and keep in touch with them after the event. 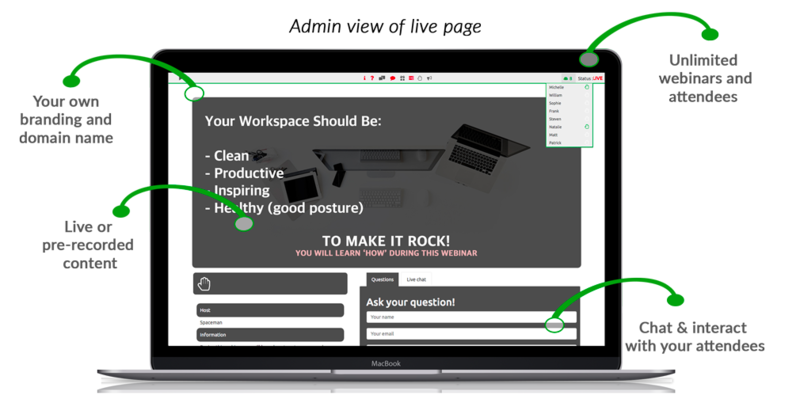 Keep this page simple with just a box for name and email, and a subscribe button, along with the date and time of the webinar and a basic description of its content – the less distracting elements there are on the page, the more likely people will sign up instead of clicking off to another area of your website. Before the webinar you can use your mailing list to send out an email to everyone who signed up with a link to the event page. You can also send out an email after the webinar with a link to the replay. On the event page you’ll need to embed your streaming video. There are a few different ways of doing this – we’ll go over a free option below and then discuss some of the most popular webinar plugins, which can create the live webinar page for you. It’s possible to create a webinar for free using YouTube Live (previously known as Google Hangouts). In order to embed a YouTube live video on your site, you’ll need to have an AdSense account and link it to your YouTube account. 4. Click the “get started” button to set up your account for live streaming. You’ll need to enter your country of residence and phone number and verify your account with an automated voice message or text before you can do this. 6. You will then be taken to a dashboard page where you can set up your first live streaming video. This page contains various options and settings, a live chat window, live analytics and stream health data, and social media sharing links. 7. Setup your webinar – go ahead and fill out the section under “Basic Info” for your video title and description and category. You’ll also want to change the privacy setting to private so that only the people signing up to your webinar can view it. There are various other advanced settings and features which you may want to explore – use the Google “learn more” links to find out more about these features. 8. Download and setup encoding software. Encoding software allows you to record video and screen and send it to YouTube for live streaming. There are various encoding programs you can use – you can see the YouTube verified ones here. Use the server URL and stream name/key provided in the “encoder setup” section of the YouTube dashboard to put into your encoding software. 9. Embed the livestream in your WordPress page. If you scroll down the dashboard page to the social media sharing box, you’ll see a “View on watch page” link where you can grab the url to paste into your WordPress event page to embed the video (you can use this same url on the replay page to embed the recorded video). 10. Add live chat. As embedding the livestream will embed the video player only with no chat box, you’ll need to add a separate chat application if you want viewers to be able to communicate with you in real time. There are a few different ways to achieve this, and you could even use the WordPress built-in comments functionality in a pinch, but using a plugin is the best trade off between simplicity and user experience. There are several WordPress chat plugins – WP Live Chat is one of the most popular. Follow the instructions for the plugin you’re using to embed the chat box in your event page. 11. Go Live. 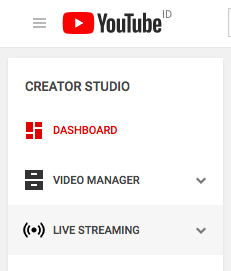 When you’re ready to start the live broadcast, start your encoder and check your YouTube creator studio dashboard to see when you’re online. It’s always a good idea to check in and make sure everyone can see your video and hear you ok before you go ahead with the main content of the webinar. It’s also recommended to do a test run of everything before trying it out on a live event. If you’ll be running regular webinars on your site or you need extra functionality that the free solutions don’t provide like integration with third-party apps and payment gateways, it’s well worth investing in a premium WordPress webinar plugin. These plugins also make it really easy to set everything up, reducing your time from around an hour if you do everything manually, to just a few minutes. Most of the premium plugins also offer a free “lite” version with reduced functionality that you can use to try out the plugin, or the free version may be suitable for your needs without upgrading. WP WebinarSystem provides an easy and convenient wrapper for running webinars from YouTube live and also allows you to stream pre-recorded videos from other sources such as Vimeo. Live chat functionality is also incorporated and the plugin can be configured to send out reminder emails to users who have signed up. The basic version of WP WebinarSystem is free but there’s also a premium version that offers additional features such as paid webinars, automated scheduled webinars, live chat, and integration with WooCommerce and major email marketing software. The premium WP Webinar System costs $197 for a single site license, or $497 for unlimited sites. WP Webinar describes itself as “the world’s easiest webinar software”. It takes only 30 seconds to install, integrates with all the major autoresponder software inchluding Aweber, MailChimp etc., and includes a number of pre-built webinar themes. 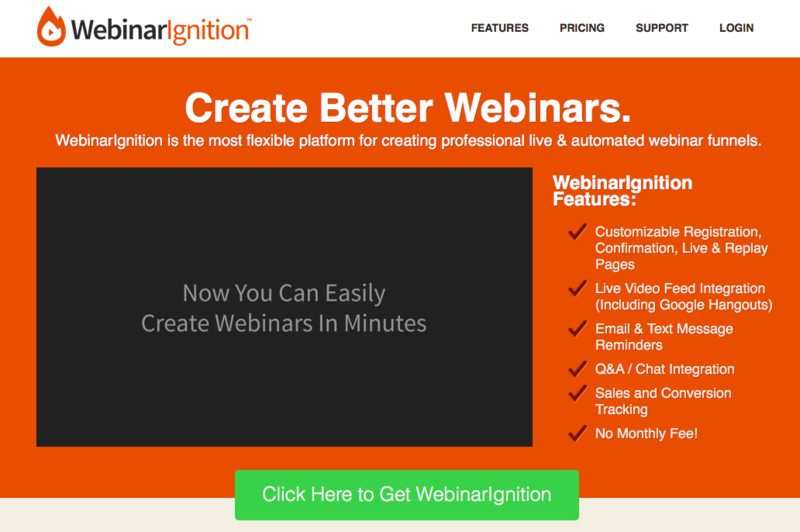 WebinarIgnition makes your life easier by offering a number of customizable pre-designed template pages for webinars including registration page, confirmation page, live webinar page, and replay page. There’s also a live console for webinar management to monitor the number of attendees, sales, and questions. Running a webinar may seem complicated but once you’ve attempted it for the first time you’ll realize that the required steps are actually pretty straightforward. There are several other premium webinar services that integrate with WordPress available and they all offer slightly different features. The best choice for you will depend on why you’re running webinars as some software is designed for those wanting to maximize sales from a webinar, while other users may simply want to relay information to their audience in the most effective way possible. If you try out a few different free plugin versions, you’ll soon get a feel for what suits you best. Using one of the premium WordPress webinar plugins or other webinar software can make the process quicker and easier but if you want to test the waters first without investing any cash, the free YouTube method is a good way of trying things out.